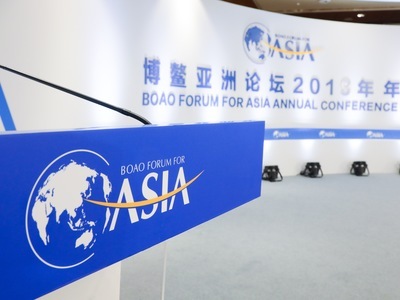 The Boao Forum for Asia 2019 conference aims to unite Asian countries, seek solutions and consensus in maintaining sustainable economic development given the uncertainties of this year's economic outlook, according to Li Baodong, secretary general of Boao Forum for Asia, at a press conference on Tuesday. "Asian countries should work together to usher the Belt and Road Initiative into a new stage," said Li, adding that the nations should also promote WTO reform and improve the international competitiveness of the Asian countries. One of the highlights of this year's forum is to provide intelligence support to the Hainan FTZ, Li said, adding that experts from international FTZs are invited to contribute their thoughts and experiences this year to the construction of Hainan FTZ. On the construction of the Hainan Free Trade Zone, which was initiated last year, Li said China will build the Hainan FTZ with its own features and characteristics. "We have a very good start with support from all over the country," Li said. Themed as Shared future, Concerted action, Common development, the Boao forum has attracted more than 2,000 attendees from over 60 countries and regions worldwide, including 14 heads of state and more than 140 ministerial-level officials, Li added. "Thousands of entrepreneurs, many from the Fortune 500 companies, as well as experts will contribute their views and thoughts on boosting Asian and the world economy at the upcoming four-day forum," the secretary general said.